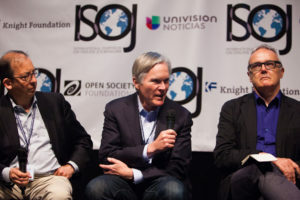 Collaboration and diversity — heard throughout the first day of the International Symposium on Online Journalism (ISOJ) — are key to the business model for nonprofit news organizations, which can lead to ground-breaking coverage like The Panama Papers, said panelists on Friday, April 15. Peter Bale, CEO of the Center for Public Integrity, offered the example of how collaboration allowed journalists from all over the world to create this massive story of wealthy politicians and celebrities avoiding tax payments published by the International Consortium of Investigative Journalists (ICIJ). “The platform of the ICIJ is a couple of years old. It is basically a Facebook for journalists: it allows them to participate and share what they are with anyone else in the group. These people are working 24 hours a day, sharing from all over the world, in a secure environment,” he explained. Collaboration also opens space for diversity, which can bring local stories to light, he said. “We need to enable new kinds of leaders, new kinds of voices, we need to diversify how people are coming” to news sites, said Joaquin Alvarado, CEO of Reveal/Center for Investigative Reporting. To that point, Alvarado noted the panel he was part of lacked female voices, although Emily Bell, director of the Tow Center for Digital Journalism at the Columbia Journalism School, chaired the discussion. Joining Alvarado and Bale on the panel were Bill Keller, editor-in-chief of The Marshall Project, Evan Smith, editor-in-chief, CEO and co-founder of The Texas Tribune, and Richard Tofel, president of ProPublica. Speaking of diversity of voices, Keller, the former editor of The New York Times, publishes inmates’ freelance reports to help form a better picture of the American justice system, the Marshall Project’s primary focus. That exemplifies how, in the nonprofit environment, it is necessary to take risks and shift away from the usual decisions made in traditional newsrooms. “What is bad news for traditional media is good news for [the] nonprofit,” Keller said. Risk-taking and diversification not only applies to writers and sources, but also to storytelling. Alvarado noted that comic books, children books, stage plays and animation also help tell stories and reach people. “We believe not only in the power of collaboration but in the power of risk-taking. We believe that there is a creative opportunity for us. It’s a golden age for storytelling. We have to actively participate in it,” he said. According to Tofel, a nonprofit is a great venue for producing public service reporting. He said ProPublica invests 85 percent of its revenue into news production, while publications like The Washington Post and The New York Times generally devote 17 percent. ProPublica receives support for targeted beats, but not for individual stories. One problem, Tofel said, is that philanthropists are more interested in supporting universities and museums and the American public do not have the habit of donating to news organizations. “We do not have a consistency of public funding with nonprofit media,” said Tofel. The solution might rest on “diversifying”, according to Smith from The Texas Tribune, an organization he proudly calls the “poster child for revenue diversity.” Events, such as the annual Texas Tribune Festival, generate roughly $1.7 million out of the Tribune’s total revenue of nearly $6.8 million. According to Smith, this is a journalism made for the public in a state where voter turnout is low. “We have a mission statement that guides us. There is a market failure on providing public service journalism. We don’t editorialize on issues; we give the information to form better-informed citizens. We don’t say what to think; sadly, we tell you to think,” he said. 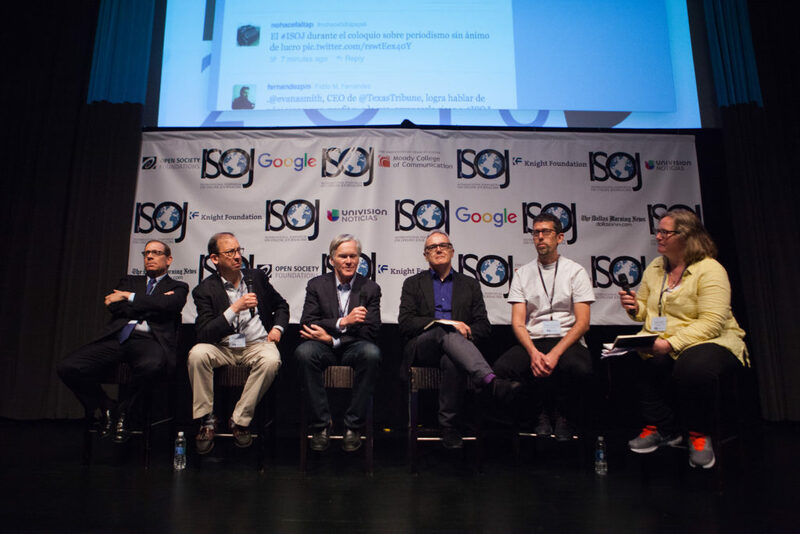 ISOJ continues on Saturday, April 16, in the Blanton Museum of Art, on the campus of the University of Texas at Austin. It is being livestreamed in English here and in Spanish here. ISOJ 2016: Nonprofit Journalism Organizations Panel, from Knight Center on Vimeo.